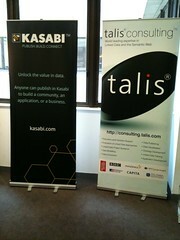 Talis “Refocusing” – What does this Tell Us? As a result of such efforts “… many more organisations are now seeing the benefits of applying semantic web technologies to help publish, share, and create value from data.” Their release goes on to say “… there is a limit to how much one small organisation can achieve…” and that “… the commercial realities for Linked Data technologies and skills whilst growing is still doing so at a very slow rate, too slow for us to sustain our current levels of investment. Many are quick to assume that this is an indicator that Linked Data and Semantic Web are being relegated to the same pastures as AI, or are making other sweeping comments. Instead, I would argue that this is more an indicator of two other things. First, it is a commentary on the success of their evangelization — with their being somewhat a victim of their own success. As a result of all the noodling, sharing, teaching, pushing of Talis and others who took the early risks and made early investment, the “big guys” (while saying they weren’t interested) were observing and the evolution of the space. As such, they have made acquisitions (think Powerset, Metaweb and Siri, among others) and have openly embraced what Talis, for one, has been promoting (think schema.org). In so doing, they have moved the game to another level. In that regard, it is not an abandonment of the capabilities, but a business decision as to the way forward for them – as a product versus service. Secondly, it points to the difficult and ongoing question as to where motivation lies for businesses to expose their data. In a business context, controlling one’s data is (like it or not) power. And APIs have been a means of opening up bits that a company deems in its interest to make available. In the same way that Web2.0 essentially facilitated the masses having their own voice, in their own control, RDFa, GoodRelations, and schema.org are examples of that happening for businesses and their data as well (think Best Buy). Mind you, the rendering of the Knowledge Graph on any particular subject/search demonstrates just how simple it is now (everything is relative!) to structure what you want to expose, for the consumption by others. This begs the question: Do we need another platform? 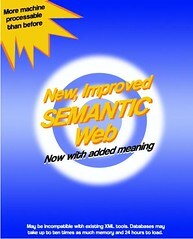 The Semantic Web and Linked Data are not going away. It is all just getting more usable (though there’s quite a ways to go), and the the concept of linkages does not stop at the firewall – but rather at whatever limit is set by those deciding to expose. (Note, this can also be phrased as “the limits chosen by those who control the particular data in question” – but that introduces another discussion topic entirely, which is whose data is it anyway). 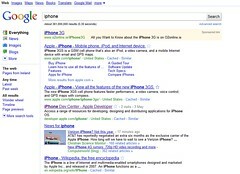 Has Google hi-jacked the Semantic Web? Can Retailers Benefit From The Knowledge Graph & Schema? You Bet! You say “Semoogle”, I say “Goomantics”. Two made up words; one meaning. Map the terms to one another, and associations to one can be related to the other. Do that within the house that Google built, and you can really traverse the knowledge graph (that was MetaWeb’s Freebase). Keyword matching is just part of what happens inside the Google machine – and more and more, sense is discerned from context – in aligning content (search results or ads) with the searcher’s intent (their meaning, in terms of identifiable entities and relationships). During the recording of the December podcast of the Semantic-Link (as of this writing, soon to be posted), I emphasized the general need for enablement of the general public to begin contributing and consuming linked data – without having to have much, if any, technical wherewithal. The real explosion of the Web itself came as a result of wysiwyg authoring and facilitation of posting content and comments by just about anyone with a web connection. Similarly, de-tech-ification of where the web is going from here is what will pave the way to getting there. There are standards and tools now for the related underlying componentry, and what is needed is user-interface development that will usher in the explosion of linked-content generation and consumption (as web2.0 did before). Toward this end, Andreas Blumauer writes about a new version of PoolParty’s WordPress plugin that extends an in-page Apture-like approach, to use and contribute to the LD ecosystem. This (coupled with other elements such as SKOSsy) is an example of the type of UI gateway that is needed in order to enable the general public to participate – with systems that generate and digest the linked-data-age information currency. Stéphane Corlosquet posted some background regarding his research, and a link to his masters thesis, on and paving (or at least mapping) the way to inclusion of RDFa in Drupal 7. The latter does a good job outlining the matter being addressed — in a a pretty digestible way even for the lay person — along with the way to get there. Of particular note is the emphasis on facilitating the leveraging of it, as evidenced by the existence of its Chapter 4, focused on usability and adoption. After all, this effort finally represents the technical equipping of content — through the work flow and processes of non-technicians to generate that content — so as to be technically consumed. This is how most of our every day systems operate (think about the behind-the-scenes code that is incorporated into Word, for example, when the bold or italics button is pressed. Once we arrived at the participatory phase of the Web, this type of invisible facilitation/enablement within everyday processes — in a usable way, no less — became an essential pathway to its semanticization. Yowser! The updated LOD cloud! Wow. If you thought the Linking Open Data cloud had grown between September 2007 (right) and July of 2009 (below), take a look at this to see where we are NOW! Some might ask where value derived from this cloud, or if membership in it just marketing? Talis’ Tom Heath outlines, in the latest issue of Nodalities Magazine, that without Linked Data, there couldn’t be a Semantic Web. Being linked and of use means having been made available following Linked Data Principles. This includes: things having unique identifiers (URIs); that are in the form of hypertext (HTTP) so they are standardly navigable (dereferencable); at which destinations there is useful and standardly interprable information (in RDF/XML) describing the thing; and which contains links to other things (read: HTTP URIs which also contain RDF/XML). Through explanation of the progression from FOAF files, (where the “things” at these “URIs” are individual people, collectively representing the basis for semantic social networks), to working out standards around what constitutes an information vs non-information resource (via httpRange-14), Tom makes the all important point that: each step along the way is an essential building block toward where we are going. And where (at this stage) is this? When Tony Shaw, of Semantic Universe, pointed to Linked Data in his recent article “Nine Ways the Semantic Web Will Change Marketing“, he was pointing to its impact on Marketing. But beyond that, we can take from his explanation the broader capabilities afforded by it: findability, pullability, mashability, mobility – essentially interoperability, as applicable to any activity, sector or function which involves information (read: data). Can you think of any that don’t? Enabling data in this way (with all these building blocks) is “one” thing – moving control closer to the end user, and toward solutions and value. Making it “usable” is yet another. Every interaction is marketing (good or bad) for the resources of the interaction. The opportunity this points to is, through the leveraging of those capabilties, to improve the experience around deriving those solutions and achieving that value. What’s real in Semantic Advertising? In the context of marketing and advertising, we’ve heard more during the last year or so, in reference to the semantic web and semantic technology. What does Semantic Advertising really mean? One interpretation – the one we’re not talking about here – is the selling of something by calling it semantic, which some have done in order to ride momentum (which I call “meme-entum”) of the space to sell something based on a loose association with the concept of “meaning” or “intent”. So what are we talking about? The strategy in the space has long been driven by word association, and more and more-so on an automated basis. At a time, placement was done on an entirely manual basis – and automation of keyword matching increasingly became the basis for new business models. That is, after all, the basis of what we now think of as contextual advertising – the alignment of what the user is looking for with the other things they encounter on the page. Since keyword matching is, well, keyword matching: what are the main differences between straight-up contextual advertising that uses keyword lookups relative to its semantic brethren? Does the addition of keyword frequency, and therefore the statistical analysis of the text, make the matching on a ranking basis qualify as semantic? Going beyond simply enhancing alignment, predicated upon statistical assumptions, is it the further use of NLP to not just extract concepts to be matched, but to determine the intent by the terms used – to better tune matches when words have multiple potential meanings? Many of us have encountered the unintentionally matched ads – which can be disastrous for a brand. What can really be done now, and how? Further on the NLP side, there is the potential for sentiment detection – so even when the correct meaning of a term is understood, determining whether its use is appropriate for matching would be based on the positive or negative connotation of its use (think here in terms of whether you would want your airline advertised next to a story about an aviation mishap, for example). Going at the question from the “semantic-web” side, is embedding (and detection of) metadata on the page just a different flavor of Semantic Advertising – or should we be calling that Semantic Web Advertising instead? This seems less prone to interpretation errors, but the approach relies upon metadata which is largely not yet there. (Because of the markup related aspects of this point, I wanted to call this post “Mark(up)eting and (RDF)ertising”, but was talked out of doing so). Is there a difference in strategy and/or scalability when considering whether a semantic approach is more viable when done within the search process, as opposed to on the content of the page being viewed? If ads to be served are stored in semantically compliant architecture, does that itself provide any advantages for the service provider? And would doing so give rise to the service being referred to as Semantic Advertising? Does this even enter into the eqaution at this point? Would increases in the amount of embedded metadata shift the balance of systematically enhanced ad selection and presentation of sponsored content – from one web-interaction phase to another? I’m looking forward to the panel – to open my mind regarding these and other factors that come into play – and what elements and trends will be necessary for the viability of the various possible directions here.